Nordegg, Alberta is a hidden gem located along the David Thompson Corridor in the Canadian Rockies Mountains If you are searching for an off the beaten path destination and a quieter alternative to Banff or Jasper National Park you will find that area around Nordegg is ripe for exploration. Nordegg is a three hour journey from either Calgary or Edmonton if you drive through the prairies on Highway 2 passing rural towns and vast farmland in Alberta. Alternatively, the route through the mountains along the TransCanada Highway or Highway 2 will add an additional hour of driving. Be warned though, there are numerous viewpoints along the mountain roads and you will inevitably stop to take in the views. The town of Nordegg, Alberta was birthed in 1914 following the discovery of oil and the subsequent need for mining workers. In the following decades, the town grew in population and prosperity, peaking in the 1940s. In 1955, the town saw the lights go off after the closure of the coal mine. The abandoned houses and buildings still standing have a particularly eerie feeling at dusk. These days you can visit Nordegg Heritage Center to gain a glimpse into the past or participate in a guided tour of the Brazeau Collieries Historic Mine Site. Tours are only available in summer so if you visit Nordegg out of season (like we did) you have a valid excuse to return to the David Thompson corridor. If as there weren’t already enough reasons! Nordegg is not your typical ghost town. The historic town site is kept separate from the tiny active community residing in Nordegg that is (slowly) growing. Amenities in the town are basic with one gas station, general store, liquor store, and a motel with a restaurant and pub. Abraham Lake is a manmade lake that showcases a stunning natural phenomenon in the ice each winter when the lake freezes over. Below the frozen surface of Abraham Lake lie frozen methane bubbles that vary in size and shape. Keep in mind that the bubbles are not found everywhere on the lake and recent snowfall will obscure their position. Exercise caution when stepping onto the lake as the ice does not exhibit uniform thickness throughout the lake. We located them at the Preacher’s Point Staging Area! Either before or after visiting Crescent Falls, ensure a stop at the Bighorn Canyon lookout point. After turning onto the Crescent Falls Campground Road off the David Thompson highway, drive for 3.5km until you reach a small parking lot. You’ll feel small as you peer down the deep gorge and watch the flowing water of the Bighorn River. It is possible to hike from this viewpoint along the canyon to Crescent Falls. However it is not recommended as people have fallen and died off the ledge here. If you choose to do so it is at your own risk. Crescent Falls are a set of two cascading waterfalls that flow down the steep slopes of the Bighorn River Canyon. There is a viewing platform above the first waterfall. For the more adventurous, continue past the railings and follow a path descending down to view the second waterfall. There is a rope to help you down and is particularly helpful in winter if you’re not wearing ice cleats. Getting there: Drive 18.1km West of Nordegg and take the first turnoff after you pass the Bighorn Gas Station. You will enter a windy forested road and drive 6.1km until you reach the Crescent falls parking lot. 3.5km in make sure to stop at the Bighorn Canyon Lookout point! Allstones Creek hike is an easy 5.4km excursion through a gorgeous canyon finishing at a waterfall. The waterfall itself is not the main attraction, the beauty of the hike lies in the journey through the gorge. In late Fall we found ourselves slipping and sliding on ice of variable thickness over Allstones Creek. Occasionally we would step through a patch thin ice and submerge our boots in water. We returned in winter where we pleasantly found the ice had formed a thick, solid layer. As a bonus, the recent snowfall had formed a nonslip surface above the slick ice which provided us with traction. This time we walked with ease; simply soaking in the impressive and dynamic geologic structures found throughout the gorge. In summer and spring make sure to wear rain boots or waterproof hiking boots as you will get wet as you walk along and across the creek. Getting here: The parking lot for the hike is 31.1km South of Nordegg. There will be a turnoff on your left, just before the ‘Allstones Creek’ sign, into a small parking lot. Cross the road, hug the railing, then walk down the hill into the canyon. Getting here: The trailhead for the Coral Creek hike is 47.6 km West of Nordegg Townsite along the David Thompson Highway. Once you see the Rockies Heli Canada building, continue South for 750m than make a right turnoff. If you go over the Cline River bridge you’ve gone too far. Look for the sign ‘Coral Creek White Goat Staging Area’. The hike to Lower Siffleur Falls offers two scenic river crossings utilizing a suspension bridge and a wooden bridge. The hike is pleasant and ends at an impressive, steep sided gorge and the first of the trio of Siffleur waterfalls. It’s an easy 8km round trip hike to the Lower Siffleur Falls with approximately 150m elevation gain. Continuing along the trail, the distance to Siffleur Falls and Upper Siffleur Falls are 2.5km and 4.0 km further, respectively. This is a popular and noisy trail in summer and fall but we opted for a winter hike and found it to be a superbly beautiful and quiet experience. Getting there: The Siffleur Falls Trailhead is 62.7m from Nordegg or 27.4km from the intersection between the Icefields Parkway and the David Thompson Highway. For more ideas and inspiration we recommend the David Thompson Highway Hiking guide by Jane Ross and Daniel Kyba. You’ll find an extensive list of hikes inside for all levels of ability and trail lengths. There are plenty of camping opportunities in the area along scenic creeks and lakes with mountain views. The campsite closest to Nordegg is the Upper Shunda Creek Campground. For information on other camping spots along the David Thompson Corridor, Westbound Campgrounds is a helpful resource. HI-Nordegg: Hostelling International Nordegg or Shunda Creek hostel is located at the end of the Shunda Creek road, off the David Thompson highway.This cozy wooden cabin is a lovely communal place to meet active and friendly people interested in the outdoors. Nordegg Lodge Hotel: The townsite of Nordegg offers one motel with basic accomodation at the Nordegg Lodge Hotel. Rustic hotel with an attached bar and restaurant. For more services and amenities consider basing yourself in Rocky Mountain House nearby. Cabins: Numerous cottages are available for rent branching off the Range Road 152A for those seeking more privacy and comfort. Never leave home without emergency medical and trip protection cover. Canadian medical care is incredibly expensive for Out Of Country visitors. We use travel insurance from World Nomads for short trips abroad. Protect yourself and your wallet from unexpected injury, sickness & theft abroad. 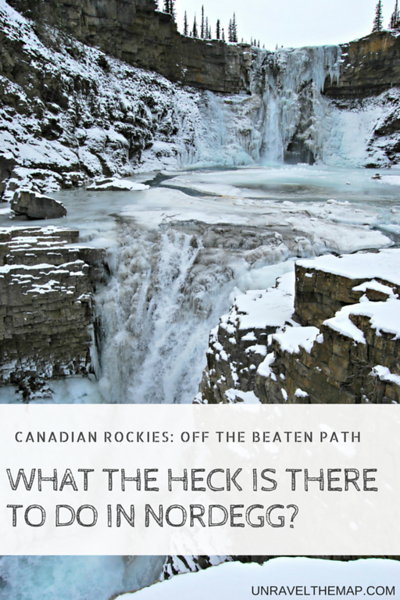 Check out more epic Canadian experiences in Yoho National Park and Waterton Lakes National Park in winter! Have you been to Nordegg? Have we piqued your interest? Share with us your favorite secret locations that you love spending time at in the comments below! wow! looks amazing! i can see myself going there! but then canada is so big, so many places to explore! I can see you going there too Patricia! Haha, I agree there is so much to choose from when exploring Canada! Stunning! Thank you for sharing these tips. You are welcome Terri! Thanks for dropping by! What a beautiful place, the waterfall is amazingly beautiful. I wonder how it looks during other seasons, I bet during the spring it’s amazing! It is indeed, Meryland! With the melting snow from the mountains in spring, the increased water volume and velocity flowing through Crescent Falls makes for a powerful experience up close. I don’t think I’d ever go indoors with all of that snow. It doesn’t snow here so I’d want to see everything on your list and even try sledding. Agreed we probably spend a bit too much time outdoors! Hopefully my mom doesn’t pull a frozen Lisa out of the snow one of these days! Sledding is a great pastime with friends and children! So glad that I came upon This! A family member is in that area for the week so i will have to pass this along to her! Great to hear Kristen! I hope they have an awesome and safe trip! That would be a fun adventure for me. I would want to hike those mountains! Great to hear Marissa, I like your attitude! We like to think so Dana! And its so easy to explore a place you’re passionate about and love! What an amazing view. I’m not a fan of snow but, I’d sacrifice just to see that breath taking scenery in person. Great to hear that Rain, I like your mindset! BRRRRR it looks FREEZING! That being said, it looks like a lovely place to visit. It can get COLD! But it depends on a lot of factors and some winters have been unseasonably warm (psst global warming)! It’s an awesome place to visit any time of the year though! Not many people have which is the best part! Banff and Jasper National Parks get all the fame and glamour so we have a slice of paradise in Nordegg. Summers in Nordegg are also lovely! This looks like such a great place to visit. I love camping and hiking and this looks like the place for outdoors fun. However, I might not visit in the winter. Fair enough! The good news is that there’s actually even more to do in summer and spring than winter. All the trails will be accessible then! I’ve never been to Nordegg, but nature is fantastic. I’d like to go once! Not many people have been that’s the best part. 🙂 If you get the chance I hope you do! That view of Cline River looks mysteriously gorgeous! I guess it is also beautiful during the season without the snow. Same here, I love the view of the Cline River, you feel very small when you’re at the lookout point. Agreed, we think it’s a beautiful spot all year round! Yout blog is awesome and I love your articles.